This etched brass pendant is a reminder that your story is yours to write. 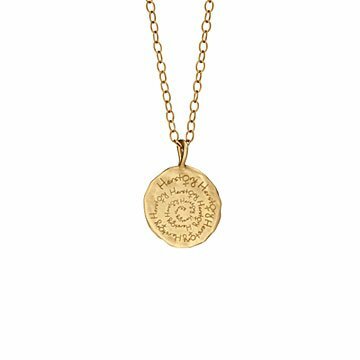 This brass pendant is a reminder that a woman's story is hers to write. It's etched on one side with the inspirational message, "Girls with dreams become women with vision." On the other side, the word "herstory" repeated in an artful swirl—notice that the female symbol is fashioned out of the "o." Give one to the girl in your life who's just finding her voice, or to the woman who's taught you how to find yours. Made in Kentucky. Chain: 24"L; pendant 1 1/16" dia.